and will be the star of your spring brunch menu! I don't know how the weather is in your part of the world, but the last week or so has been absolutely beautiful here in Michigan. We've finally been getting lots of sun and warmer temperatures, and by warm I mean in the 60's. Which is warm for us Michiganders. 😎 I've been watching my cherry blossom tree go from tiny little buds to full on bloom in just a matter of days, and the trees and other bushes are blooming with new leaves, too. This my favorite part of spring! Another spring favorite of mine is celebrating Mother's Day. My mom is my best friend so although I celebrate her every single day, I love that there is a dedicated day to recognize her and spoil her even more. One of the ways I do that is by hosting brunch for my family every year. She always says to me that I'm a mom too and shouldn't have to "work" on Mother's Day, but I don't mind one bit. 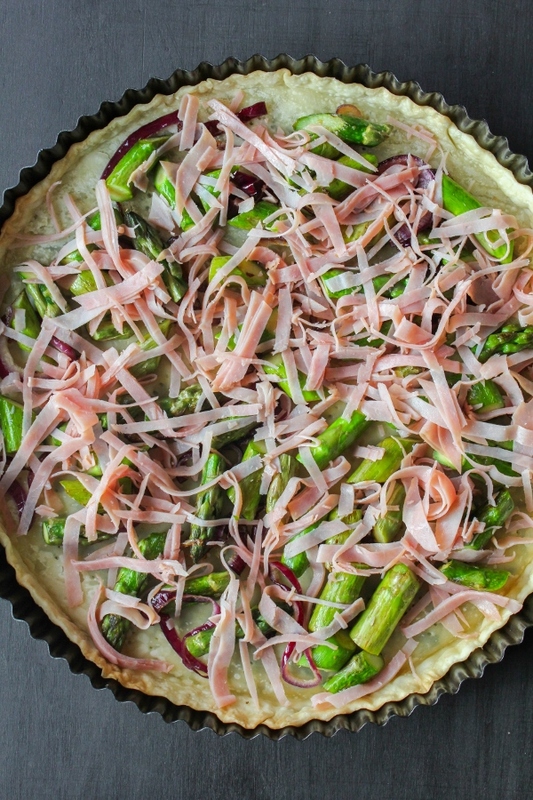 This year I'm adding this gorgeous Rustic Ham, Asparagus and Goat Cheese Tart to our brunch menu. It's easy to prepare and can be made ahead of time, which is the best part. More time to spend with my mom and not in the kitchen! This tart is delicious warm from the oven, but equally as delicious at room temperature. 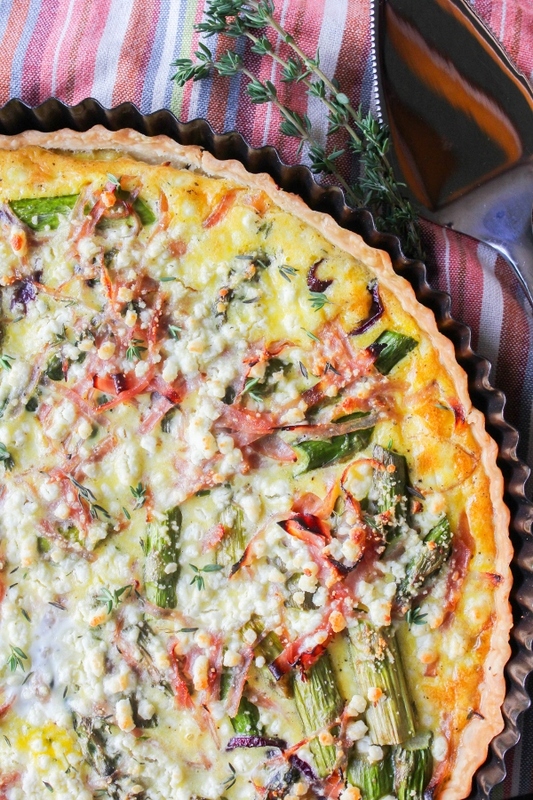 This tart is made with Castle Wood Reserve® Honey Ham, one of my absolute favorite meats. Castle Wood Reserve® is a full line of premium deli meats that are versatile enough for a charcuterie board or a lunch box. I make sandwiches with the meats, little appetizers of meat and cheese on crackers, and it's perfect in this tart. For this recipe I roll up several pieces of ham and cut them into very thin strips, then spread them all around the tart. 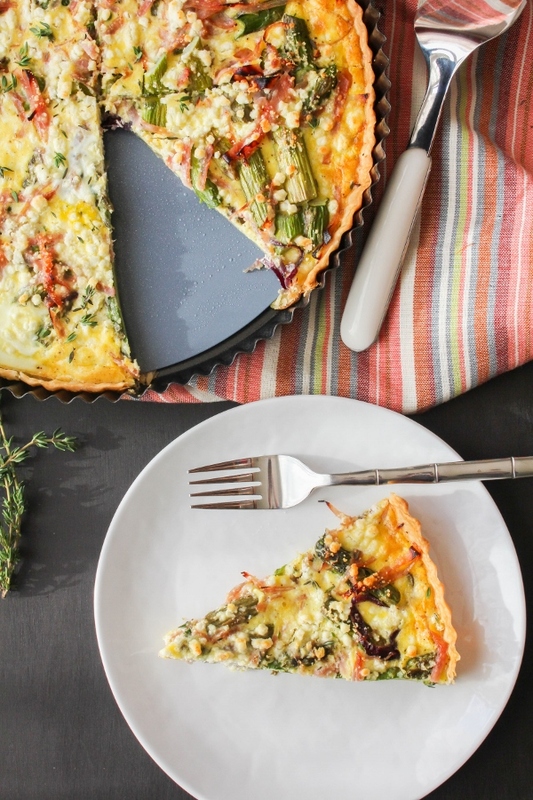 Paired with fresh asparagus and creamy goat cheese, this tart is full of flavor! Preheat the oven to 400 degrees. On a lightly floured surface, roll out the pie crust into a 12-inch circle. Press the crust onto the bottom and up the sides of an 11-inch tart pan with a removable bottom. Using the tines of a fork, prick the crust all over. Place foil into the bottom and up the sides of the crust and fill it with pie weights or dried beans. Bake the crust for 10 minutes. Remove the weights and foil. 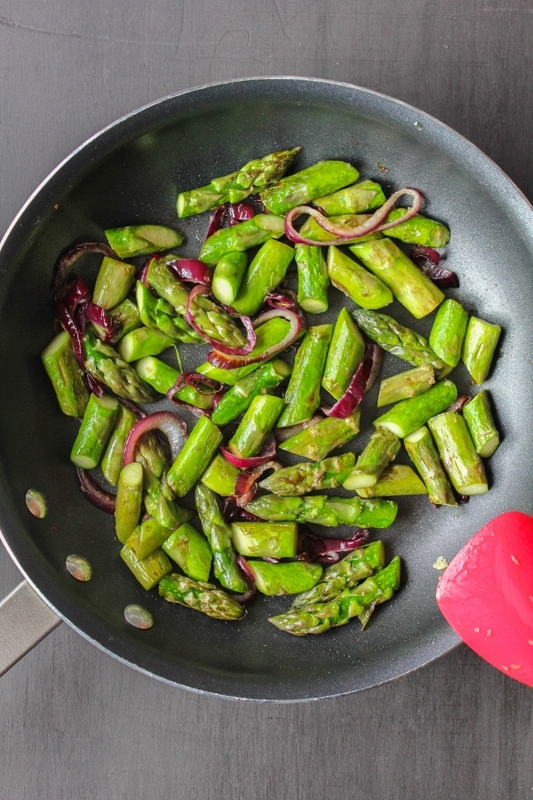 While the crust is baking, heat the olive oil in a large skillet over medium-high heat. Add the asparagus and onion and cook for 8 minutes, stirring often. Add the garlic and cook for an additional 3 minutes. 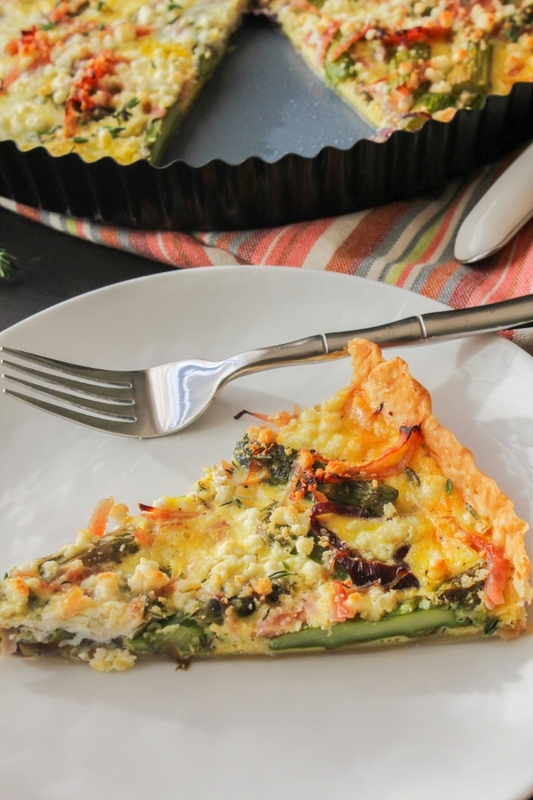 Spread the vegetable mixture evenly in the crust. Add the strips of ham on top of the veggies. In a small bowl, whisk together the eggs, cream, thyme, salt, and pepper. Slowly pour the egg mixture into the crust. 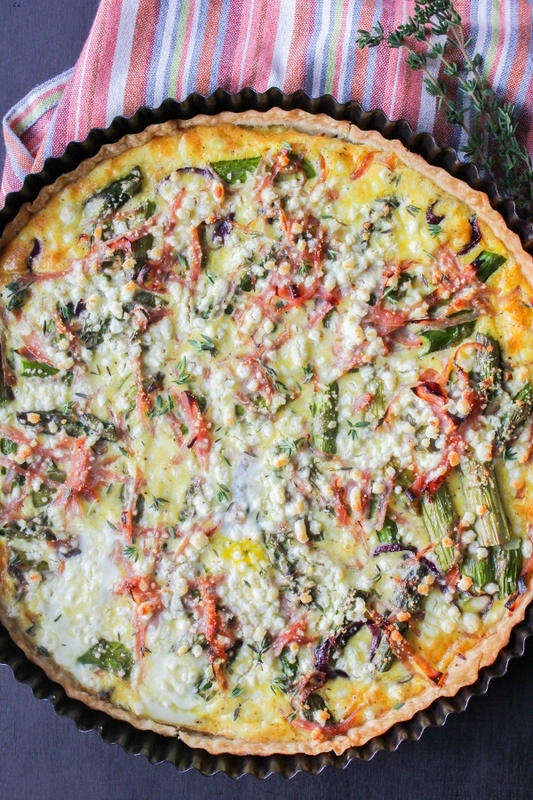 Sprinkle the goat cheese evenly over the entire tart. Place the tart pan on a baking sheet. Bake for 25 minutes, or until the center is set and the crust is lightly browned. Let the tart stand for 10 minutes before slicing and serving. 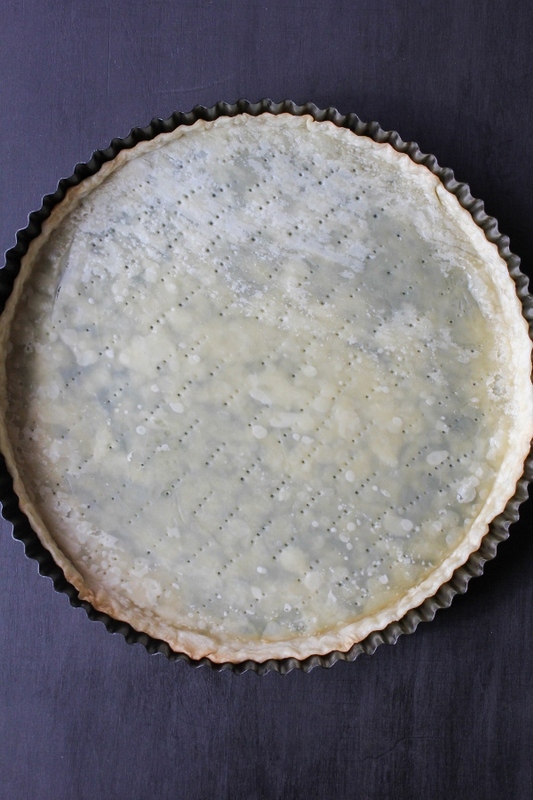 The tart can be eaten warm or at room temperature. 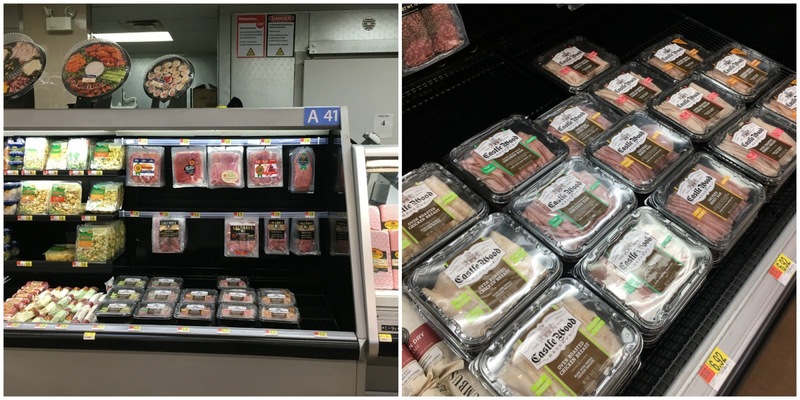 Find the entire selection of Castle Wood Reserve® meats, along with everything else needed to make this tart, at your local Walmart store!